All I wanted for Christmas in 2009 was a Sonos. Almost nine years have passed since I purchased the first S5 player (they’re called differently now), and we enjoyed the system so much, that we recommended it to quite a number of friends and acquaintances who’ve also bought Sonos equipment. Sometimes more of it, sometimes fewer parts, but Sonos it was. Then came the time when we got miffed about the “new” and “improved” UI on the Sonos mobile apps on iPhone and iPad. To us the apps became almost useless, and I got the (probably incorrect) impression that each incantation was completely different from the previous. That bugged all of us here at Casa Mens, but I put it down to “getting old and farty”. I got pro-actively upset last year, when the apps started informing me I’d need to create a Sonos account. I didn’t want a Sonos account and certainly did not believe that my “listening experience” would improve from having an online account. I really got upset when, on the weekend, I couldn’t play music because the apps required updating, but wouldn’t do so without me having an account. OK, I thought to myself: don’t be such a wimp. That one more account won’t really hurt will it. It does. And I am thoroughly angry. The next day, I decided to actually log into the sonos.com site with the credentials I created, and I will admit I was shocked (yes, me, I’ve been on the Internet for a few days) to see some of this. First of all, Sonos knows when I’m at home and when I’m not. Of course they know, but it’s none of their business, and even less so to record and store that information. Not only that, but they also tell me how much other people listen to their music on average. What’s that supposed to do? Show me theirs is bigger than mine?! They also know what I listen to. It’s none of their bleeding business. 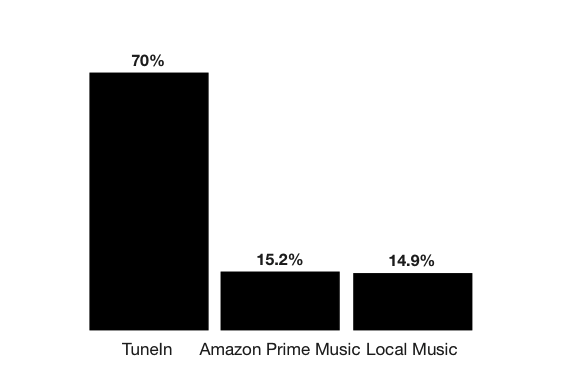 That’s precisely the reason we have most our music as MP3 stored on a NAS at home. I expected only us to be privvy to that information. When was one of us at home listening to music? They know that too. I told the wife about this, and she was livid. Her exact words were “They know when I’m on the crapper in the bathroom putting on makeup?! ?” Yes, dear, unfortunately they do. It’s my fault though because nine years ago I labelled the players by where they’re located; I thought it’d be practical, but I see I should have chosen names like 7354e2055eb803b3b4ccd7c2d317a064 to better protect our privacy. Please forgive me! 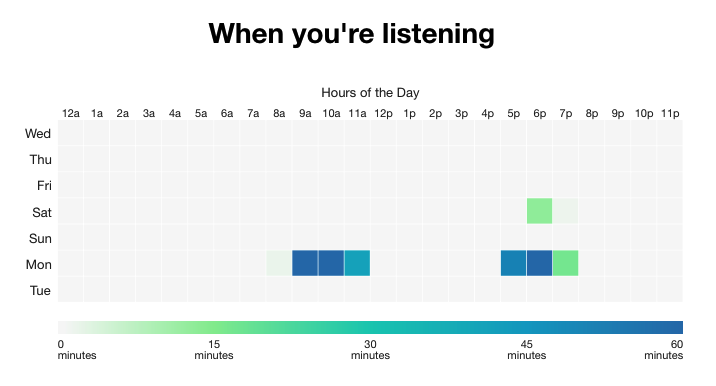 Oh, dear Sonos people, how long was the total playing time in my household last week? I’m sure you can tell me that too. Thank you. 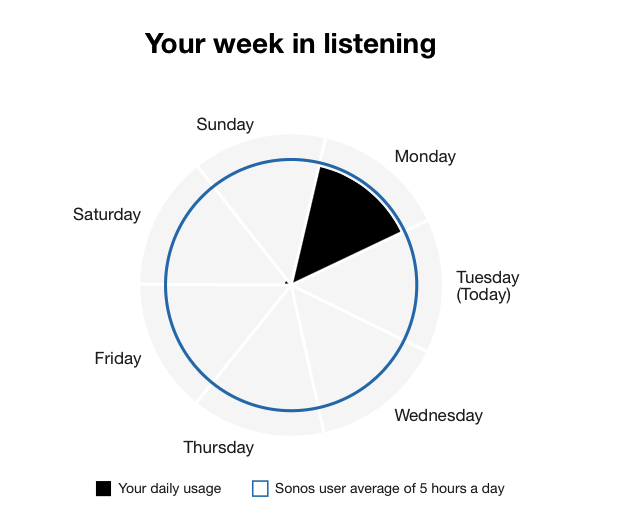 And I’m sorry I listened to 5% less than last week; I’ll try to improve on this. The Sonos privacy page is full of it. Text. Lots and lots of it. Sometimes I wish I were a lawyer. I read it top to bottom. It’s a shame most people probably won’t have the pleasure of studying it. If you don’t, at least search for opt out and do that. I opted out and the data no longer shows up on the Web page when I login to Sonos. Whether or not the data is being transmitted I do not know. What I also don’t know is why my account had this enabled; it appears as though others’ have this disabled by default. Is it because they’re newer to the game than I? I’ll never find out. you will not be able to opt out from this [Functional] data collection, sharing and/or processing if you want to continue to use your Sonos Products. Do I need to register my Sonos products for them to work? Yes. This is fundamental to providing a secure internet–based home sound system. How do I delete my personal data from Sonos and what are the consequences? You can always send us an email via privacy@sonos.com or contact our Customer Care team and request that your data be deleted. Please note, however, that by deleting your personal data your Sonos products will stop working. If I lived alone, I would now show you a photo of all my previous Sonos equipment in the boot of the car, ready to be given to somebody who wants it, and that may still happen. I don’t live alone, and we’re still thinking about how to handle this situation for ourselves. In case you follow me on other parts of the internets you’ll know that privacy has become important for me in the course of the last quite a few years. Call me naive for not having found out sooner, if you like, but this angers me beyond belief, and I am hugely disappointed by a company I previously admired. Needless to say, I will begin apologizing to friends of ours who followed my advice, and I will warn them. “Also, purchased the last Play:5 as a used model, because I do not want devices with microphones for this purpose (have no use for digital assistants at all, I just want good speakers).” – Yes, read their privacy statement on listening devices. I don’t want a Sonos account. I have enough accounts out there already. I paid a lot of money for the hub and speakers and now my usage is being held hostage to Sonos’ desire for that fat data harvesting loot? The last couple of updates had a “skip” button re: Sonos account, and that was annoying but acceptable, barely. Forcing an account is just **. I bought my first Sonos speaker, a Play 5, on November 8th 2009. I didn’t have an account then. I bought my second on November 24th of the same year. No account. I bought my third in September 2010, no account. Your condescending explanation clarifies Sonos motivation for login somewhat. I don’t care. If Sonos has explained it clearly before forcing it I would have agreed, if grudgingly, but I have to hear it from some snarky tool in a forum? Yes, you did have an account, Sonos has always required you to have an account. Here’s how it worked: Your initial purchase required registering to an email address, which became your account. Each unit after that was assigned to the account automatically. They have recently replaced the automatic assignment in favor of requiring account information to prevent unauthorized devices from connecting to your system. This has nothing to do with data collection, they’ve already been collecting your data for years now. They’ve been collecting my data for years now.